President Barack Obama has never attacked the 2nd amendment. But. Since he’s been president. Gun sales have soared. There were over 65 million guns sold during his first term. The election of a Democrat to the White House was enough to cause 2nd amendment crazies to go well…crazy. There was widespread fear of new gun control laws. Certain weapons would be banned, they said. Ammo purchases would be limited only to types allowed by the federal government. I believe the craziness was also driven by some unspoken racial fears. How would blacks react to the election of a black president? Would they become bolder and more demanding? Will they pour out from their inner- city ghettos into white suburbia? What I’m saying is this: This massive six year wave of gun-buying was caused by pure 2nd amendment paranoia. And racism. But mostly paranoia. For the last six years we’ve witnessed the panic over and over. Obama is coming for your guns! He’s got a secret plan to repeal the 2nd amendment! He’s going to disarm conservatives and put them in camps! None of this true. Yet the fear persists 6 years on. With every tragic mass shooting there was brief media attention placed on gun control. There was the push to create a national gun registry. There was a plan to install nationwide background checks for gun purchases. None of these came to be. These ideas were killed by gun lobbyists. These are the folks who actually run D.C. In case you had any doubts. You would think any potential law that has as over 80% approval from the American public would be a shoo-in. Right? ………..Wrong. Not with the National Rifle Association running the show and writing our gun laws. America is a violent place. We’re in the midst of a seemingly endless tide of gun violence. From police shootings to school massacres that place with alarming frequency. In this climate pro-gun activists have come to rely on the 2nd Amendment as their trusty shield when faced with mass-shooting-induced criticism. They interpret it this way:The 2nd amendment guarantees an individual right to bear arms. This reading was endorsed by a very conservative U.S. Supreme Court in 2008. Their ruling in District of Columbia v. Heller was a drastic change from the traditional view. For over two hundred years, most judges and legal scholars reached the opposite conclusion. They found that the amendment protects gun ownership for purposes of military duty and collective security. Keep in mind the 2nd Amendment was passed in 1791. This was early years of post-colonial America. At the time it made sense to arm most men. Those men could quickly form a local militia if needed. This was the easiest way for a community to protect itself. The idea of a standing army was foreign to most Americans. It in fact , was exactly what they were trying to get away from. The 2nd amendment contains two clauses. The first part is the “militia clause”. The second part is “bear arms” clause. Before 2008 all of the courts had ruled that the first part trumped the second part. 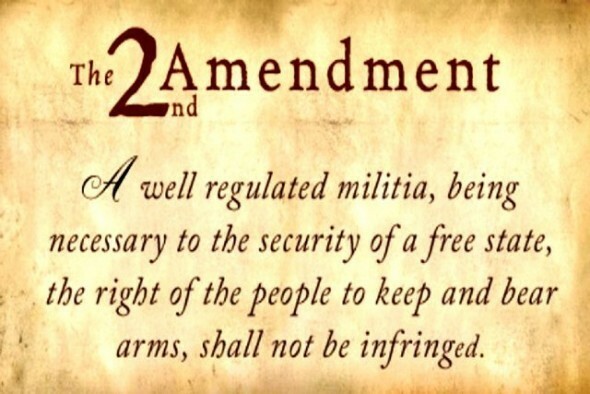 This meant the amendment gave only state militias a right to bear arms. So individuals had no right to gun ownership. Enter the modern National Rifle Association. This was not your father’s NRA. By the 1970’s the organization had changed quite a bit. Before this time they were devoted to non-political issues. Gun safety being the main one. But in 1977 there was a drastic change in leadership. And a whole new NRA was born. This new group was committed to pursuing conservative political power. They were going to all but take over the Republican Party and control its gun agenda. The new NRA pushed for a different reading of the 2nd Amendment. This new interpretation would give individuals the same gun rights as militias. But, the NRA was determined. And they pulled a very neat trick here. Conservatives almost always advocate for “originalism”. They think the meaning of the Constitution was fixed when it was ratified in 1787. They hate the idea of a “living” constitution. One that changes meaning according to the values of the time. In other words the meaning of our Constitution is set in stone. But there is no better example of the living Constitution than what conservatives have done with the 2nd Amendment. The gun lobby’s drive to re-interpret the 2nd Amendment was a brilliantly calculated plan. They used their resources to work both inside and outside of government. In 1980 Ronald Reagan became president. Of course he was a gun advocate’s dream candidate. At the same time, Republican Senator Orrin Hatch of Utah, became chairman of an important subcommittee of the Senate Judiciary Committee. He commissioned a report on the 2nd Amendment. The committee claimed to find long lost proof that the 2nd Amendment had been misinterpreted for nearly 200 years. And that it does grant an individual right to bear arms. The NRA began paying for academic studies of their own. Before long, a dead and buried constitutional theory found new life. It quickly became conventional wisdom. The NRA. The Republican Party. The Gun lobby. Through brute political force, they changed the way we think about the 2nd Amendment. And so, unfortunately, this new theory became the law of the land. In 2008, the Supreme Court upheld the individual rights theory. The case was called District of Columbia v. Heller. Justice Antonin Scalia wrote the majority opinion. The court had to twist itself into a political knot in order to arrive at their decision. In the early days of America, militias were serious business. They were well organized and armed with the latest military hardware. So you can see the problem. In modern day America civilians aren’t allowed access to the latest military weaponry. We can’t go out and buy and M-16 rifle. A Stinger missile. A tank. So the government can’t ban handguns. It appears they can ban other weapons. Like the assault rifle for instance. The actual meaning of Supreme Court’s Heller decision is still being played out. But this should tell you how much our understanding of the 2nd Amendment is influenced by politics. This also shows the courts are in fact influenced by political pressure. They didn’t move to the right on gun control all on their own. Things can change. But only if lawmakers feel the wrath of their constituents enough to defy the gun lobby and its money. The battle over gun control is not just one of individual votes in Congress. It’s a continuing clash of ideas, backed by political power. In other words, our present interpretation of the 2nd Amendment is not set in stone. No law, not even the Constitution, ever is.